During my daughter's birthday, hubby and I were actually thinking of where to bring the kids for dinner, they are four , bytheway, having to consider what each one likes and what they are to say with what they may order. Passions means differently for every people. It defines how they look at life and what actions they do in lieu of it. 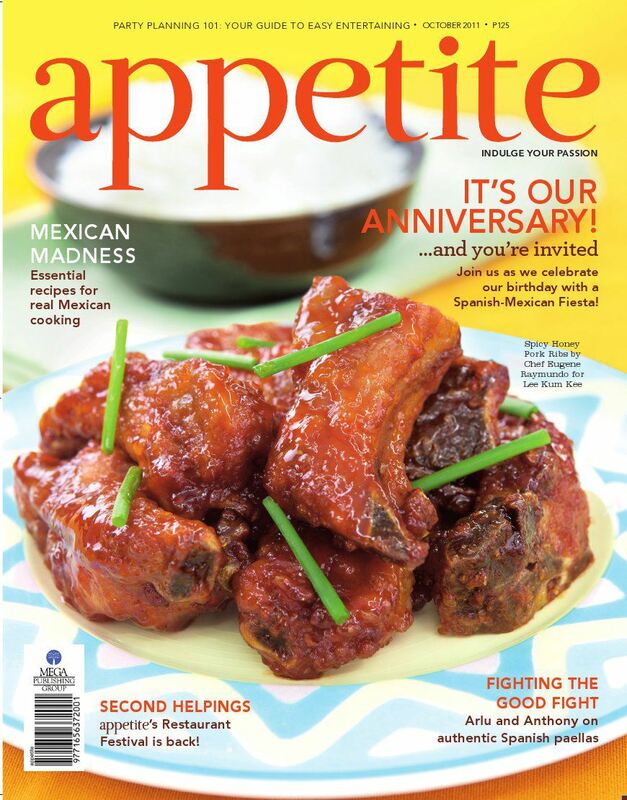 For a food blogger, it may be about cacoethes or admiration on food and anything that surrounds the idea of it. For an advocate it may be the strong feeling of doing something worthwhile and thus becoming a catalyst of change. For parents like us, it is an encompassing emotion that you do to give your kids joy, and my case, the joy of eating. HHmmm...Funny, I guess, that could be why I was named Joy, one of my passion is really being able to give joy in whatever I do for others and therefore doubling the joy that ricochets back at me. I posted a blog already about how we made our daughter simply happy, with her classmates and her surprise cake and a tour at Cosmic Center. As a continuation to my daughter's birthday celebration, we decided to go to Uno Pizzeria. And passion indeed nails down Uno Pizzeria's fair game. 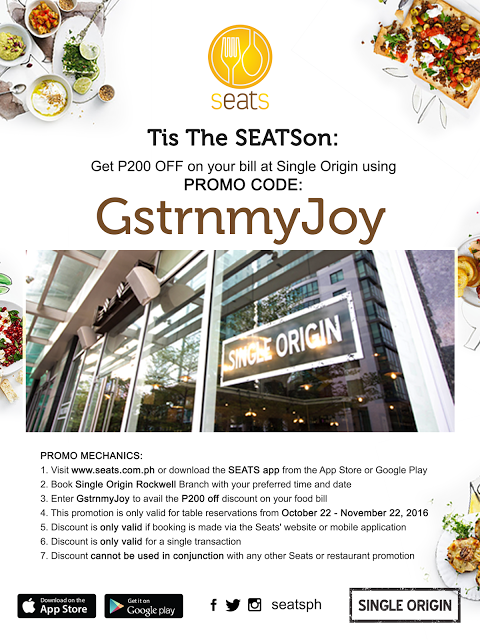 Their enthusiasm in giving every customers their dining and yeah, entertainment pauperism take in customers. This isn't our first time to eat here. I did thought though that this is not an establishment where couples or families with kids could enjoy. I was wronged. Well good thing we did come back, for me to find that out. You'll see as you scroll down further and check the pictures out. They were renovating when we visited, and it wasn't crowded for it was Thursday, however I've heard that usually they are at night especially weekends. Now they have family packages in their menu ranging from P800 to P 1300, which is quite hefty for 4 to 5 angry tummies. We had the package complete with pasta, side dish, chicken and rice, pizza and pitcher of iced tea. The Buttered Chicken came out with plate-full of large Onion Rings. The steamy rice came in next, that's the time my kids were clapping their hands in awe, all ready for their challenging taste test. These crispy-liscious chicken won me over. The glaze is adorable, the buttery scent and flavor adds to it. Though the sauce were smothered as if sticking to the outside of the meat, didn't ruin the crispiness of the skin., but the inside was soft and savory. The Onion Rings was not so sale-able for my kids, for one, they don't eat raw onions, however they did make some bites. My husband and I liked it, it's more like an onion tempura and when dipped to the dressing becomes a snack in itself. And the plate that emptied first, the one with Shrimp Scampi. The pasta (lunga), seemed to me like one of my favorite pasta dish, Sphagettini al Gamberi, though this one has cream sauce. I just can't remember if it's cheesy as a Mornay Sauce or just light as bechamel sauce, whatever it may be, all I remember is that it left us all speechless when our mouths were filled with them. The highlight of the evening...tadahhh!, Cheeseburger Pizza. Dear God, this pizza is so big and the savory aroma (like that of a fave cheeseburger of mine) almost enveloped the whole table, our tummies are a bit full, but we dare not give in the the pizza's calling. As you can see, my son was so thankful, and looked as if he might be in pizza paradise, as we were able to give them out of our passion, the dinner we haven't had for months now. A dinner full of precious family time. Do you think we finished the pizza? They tried, oops, that doesn't mean they didn't like it, they couldn't finish it. The pizza, full of beefy and cheesy goodness, qualifies as one of the best pizza in town. I did like the pizza we had also, the last time we went there, well that's way back June. The Pizza-monsters, hihihi, I don't know what my daughter is doing at this picture, but everyone sure did revel my daughter's birthday. Now the perfect endings, for a passion full of revelry with refreshing Parfaits for dessert. Dana with Calamansi Sherbet/Sorbet with toppings-galore. Thanks Miss Girlie Herrera ( the restaurant Supervisor), for these sweet treats. The icy, tangy and lucet desserts are perfect for these tummy-filling meal. I never really thought that a hint of chocolate blends in so well with crystallized Calamansi and Lychee puree. Chocolate Parfait for the birthday celebrant. Indeed, we felt the passion from Uno Pizzeria Ristorante Bar. I went home tonight from a brief night out to attend an event at Pan Pacific. Yesterday, during the storm, it was pitch black outside our neighborhood, as an effect of storm Pedring. Certain light outposts have been damaged leaving part of our "barangay" without electricity. Just so thankful that from a far I can see our home lighted up, and feeling a bit sorry for my neighbors specially my in laws who lived a few blocks away from us. That being said I came home, with our living and entertainment area jam packed, as if we have an impromptu pajama party, though no one was wearing pyjamas, hahaha...My babies lined up in front of the 35 in LCD Tv, sound systems to the max, with them are their three cousins and my brother and sister-in-laws. I'm happy getting home seeing them, safe and enjoying the night with Smurfs on the screen and with me are bags of "bibingka and puto bumbong" for "pasalubong." What I'm really happy with is having people appreciate my writings with what I do as part and partial to keep me sane...nope, I'm not crazy, but God amazes me with how he opens up not only windows but doors of opportunities for me to use my spare time with and with simple words that emerge as I type what's on my mind. I guess you're wondering where in Lala land have I been to, feeling this way, It's at Pan Pacific Manila. As their catchy lines resonated in the Renovation Grand Launch party - "New flavours are served hot at the first and finest Butler hotel in the Philippines! 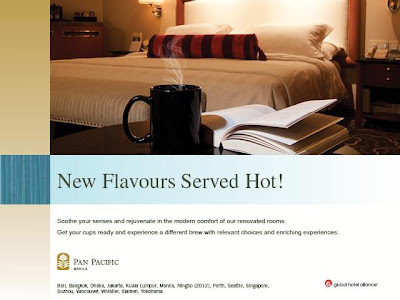 "- I was able to take part, as Pan Pacific Manila unveils its revamped guestrooms. Johnny Litton, from the "Oh No, It's Johnny" 1980's show, was the master showman for the night, giving the audience his timeless wit of entertainment. With the picture above are some of the people who made Pan Pacific as prosperous and opulent as it is, included was Richard M.P. Masselin, the General Manager of the hotel.. Also a cocktail dinner was made enchanting by the musical performances of the Bernie Pasamba String Orchestra. How I love it when they played the Firework song of Katy Perry. The dinner I had was ultimately lovely but I know only a few people, actually I could count them on my fingers. All thanks to a friend who has lots of connections (exaggerating but true) and having tagged along was a true blessing. As I was nearly done cleaning the kitchen, the words from one Smurf reached my mind, "you know it's the right message when it comes from the heart." I don't really consider my self as a good writer (hhmm, humble), as compared to the likes of Lori Baltazar, Margaux Salcedo, or even Anton Diaz, though I keep it in mind that whatever anyone reads here are reflections of my gratitude to the people who have made it possible for me to experience it all, in genuine, concise and honest-to-goodness observations, that became words. For reservations, call (632) 317 0788 and ask for the Butler, of course! get exclusive invites for two (2)! Festival will be launched to usher in the occasion. Save/download the Appetite Food Festival Poster and post it as a photo on the fan page wall. 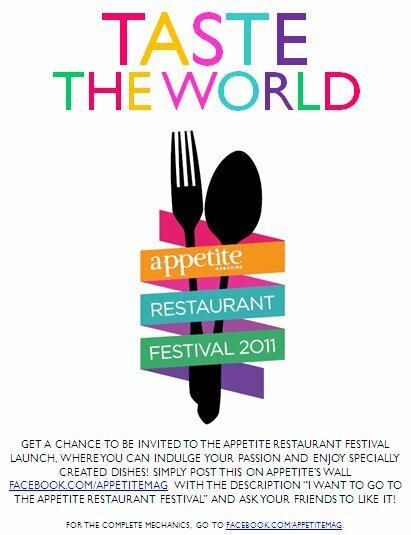 The title/description of your post must be “I want to go to the Appetite Restaurant Festival!”. Only one (1) post per participant is allowed. Invite your friends to like your post. The three (3) participants whose post got the most likes by October 12, on or before 5pm, will be declared the winners. Each winner will receive exclusive access/invites for two (2) to the Appetite Restaurant Festival launch on October 13. Winners will be sent a notification message. In case of a tie, the participant who first accumulates points based on the time stamp of likes will be declared the winner. I once heard or read that Thursday is the new Friday, due to the hassle of going to crowded bars and restaurants even at wee hours people make arrangements for other weekday get-together. So I guess this answers my query on why Diamond Hotel have set up whirl to hurl up diners back at Corniche. 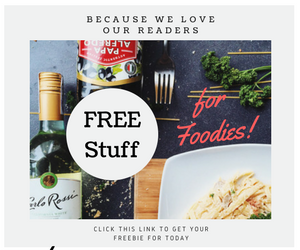 I've been receiving invitations on my e-mail on some of what they could offer in terms of food adventures. With the brief statements came along these discount printable vouchers or coupons that you may enjoy. My husband and I had some share of well-rounded experiences with Corniche, so why don't you also have your own. 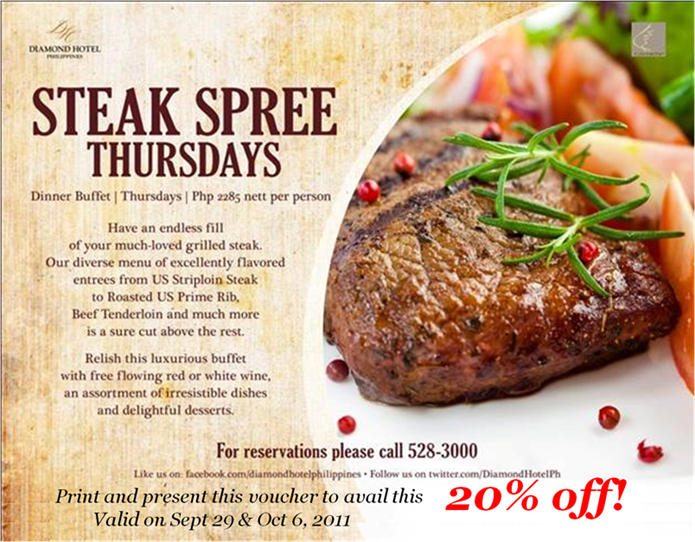 Thursday night is a Steak Night at Corniche. Unleash the carnivore in you and dine on a succulent choice of steaks; from US Striploin Steak, US Rib Eye Steak, US Hanger Steak, Beef Tenderloin Steak and Roasted US Prime Rib seasoned with the savory marinades and seared to perfection. 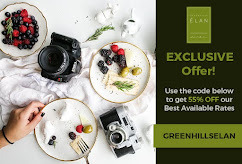 Get your limitless fill of this gourmet grill together with a free flow of red or white wine for only Php 1,828.01 nett per person (valued at Php 2,285 nett). So how's that, a whopping 30% slash off to your usual Friday night savoir faire. Thank God for Friday nights of abundant Seafood! Get your knives and forks ready and indulge in a bountiful spread of lobsters, crabs, scallops, mussels, shrimps, prawns and fish entrees meticulously prepared by Diamond Hotel’s culinary team. Have them cooked your way, whether you want it with garlic, buttered, steamed, fried or spicy! Along with a free flow of red or white wine, savor this fantastic treat for only Php 1,259.99 nett per person (valued at Php 1,800 nett). Dinner buffets will never be the same again with the wide range of offerings at Corniche. 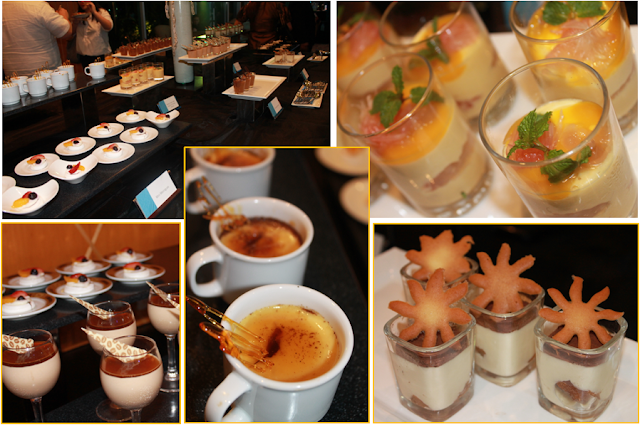 The buffet also features regular sections like the Japanese corner, appetizer counter, dessert station and more. 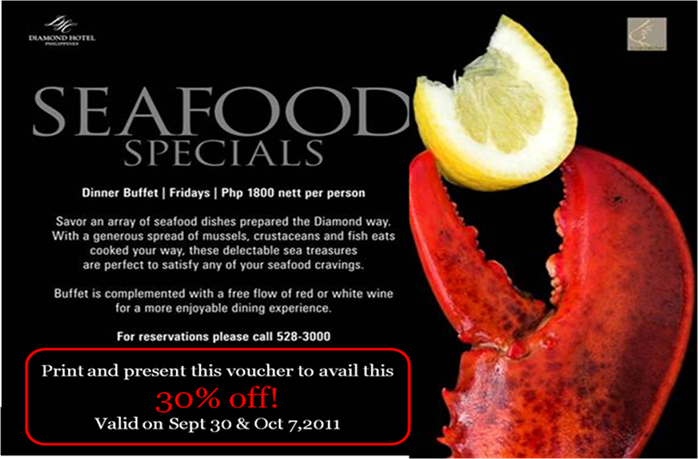 For inquiries and reservations, please call Corniche at 528-3000 ext. 1121. All promotions may not be combined with other discounts or offers. So what are you waiting for Print out the pictures and share with your friends and loved ones. Roxas Blvd. Corner Dr. J. Quintos St. This could have been printed on a powdery-scent, light pink board with matching Barbie stickers. But we opted having the celebration simple and private. Our youngest daughter who didn't ask for anything else but whatever that is Barbie-doll themed, just grinned and said to her Dad, "It's okay not having Jollibee visit our school on my birthday, as long as Ate Dana is not sick anymore." She prayed that her sister Dana will be with her at school to share her cake with her classmates and teachers. Just days before her said and planned birthday, Dana our third child was stricken with Pneumonia, and having her blood sugar unstable, having to rush her to the hospital at 1 in the morning. But the Lord is so gracious that she was able to recover fast, though our plans were completely mishandled due to some financial instability. But this should not be a reason why she will not be happy on her birthday, I will not let that happen. Once after we got out of the hospital, I went to a nearby specialty bakeshop outside Magallanes Village in Makati, to check out what I can get for her on that day. We never told anything about her birthday, except that I will be baking chocolate cupcakes for all of them. She didn't ask anything also, not even a birthday cake. She understood very well the situation we were in. But I managed to keep this a secret to her. Here everyone look on as my daughter blew her candle. Before that her teacher led a class prayer for her and chosen kids were given a chance to greet her in a fun and playful way. We had a taste for ourselves, the soft, airy and light Vanilla Cake Aggy's made. It was very good! The cake wasn't that sweet to lessen the sugary effect of the marshmallow frosting and the candy toppers. For others it may be a bit pricey as compared to commercial cakes, but you have to taste the difference for yourself and you will definitely say , it's worth the price, anyway, the joy of a child on her birthday is priceless! And no her happy day didn't end there, the whole family went to Museong Pambata, to give in to their request, but then we came in 15 minutes before it closed so we went to Cosmic Kids of Mall of Asia instead. I woke up this morning with thoughts of my daughter's birthday last year at Boracay. Danica, our youngest turned six last Thursday. No, it wasn't a big bash, it was a simple yet quite a fun and playful day for her and her sister, Dana. I was a bit saddened when I had that day compared to what we had last year. We celebrated her fifth birthday at the sunniest beach of Boracay, for a three-day and two-night beach bumming and island hopping escapade. What had really bothered me much though was the dinner we had on our second night, a date I longed for. While my kids and inlaws had Shakey's pizzas and Deco's La Paz Batchoy at their La Carmela hotel room, we were at Don Vito's Ristorante Italiano. Boracay Mandarin Island Hotel, had set up a tent place for diners of Don Vito's along the shore with ambient lightings and an acoustic stage performance. One of the dish we had that is vivid in my mind is the Chicken Cordon Bleu which haunted me the whole morning. Hopeful, that this Sunday won't keep me down with those thoughts. Hopeful, that this day and the days to come will be much better than the latter days we had before Danica's birthday. Hopeful, that behind those disappointing thoughts a brighter future awaits ahead of us, specially my kids who were a bit traumatized with their sister's health condition. Hopeful, that September won't end without having to savor even just a hint of the gustation we had a year ago. Til' a text message appeared for an invite at Mercato Centrale. That Sunday had been a blissful continuation of what could have been just a hopeful Sunday. God confirmed us that everything has a purpose, my daughter having diabetes, each difficulties we face, having to put up with people who care less of you though you've given enough attention to them and the list goes on. As been said to us over and over, " And we know that all things work together for good to them that love God, to them who are called according to His purpose." (Romans 8:28, KJV) I still fought to believe that there is still a miracle awaiting to happen and blessings awaiting to be realized, as long as one has faith in God. After the church service, we head on to Mercato Centrale, it was 12 o'clock when we left the church and we are all starving, and, still the Chicken Cordon Bleu was haunting me. Then I remembered that Chef Luigi Muhlach have a slot there and one of the food he sells is his specialty, Chicken Cordon Bleu. Then I thought he might not be there because he had Midnight slots (That's for Midnight Mercato). We went there primarily to meet a friend, whom I plan to suggest a business with. And lo and behold, Bistro Better, was there and right at the spot where Chef Luigi's was. Then my depressing thoughts about not having Chicken Cordon Bleu melted, instead I will be having Chicken Galantina. Both of the dish mentioned are meat treasures for me, along with , Morcon, Rellenong Bangus and some other stuffed meats. I've never learned being a savvy meat-stuffer, though I love this kind of recipes which poses a lot of challenge. We intended to buy stuffs for the older kids left at home at the Mercato, we thought of scamping around for whatever is new there. I've been to Midnight Mercato for a couple of times, though this is my second time during the day. And I could never recollect seeing any dish as savory as these ever sold there, and during fares or bazaars, to be blunt, these are the first on my to-find list. 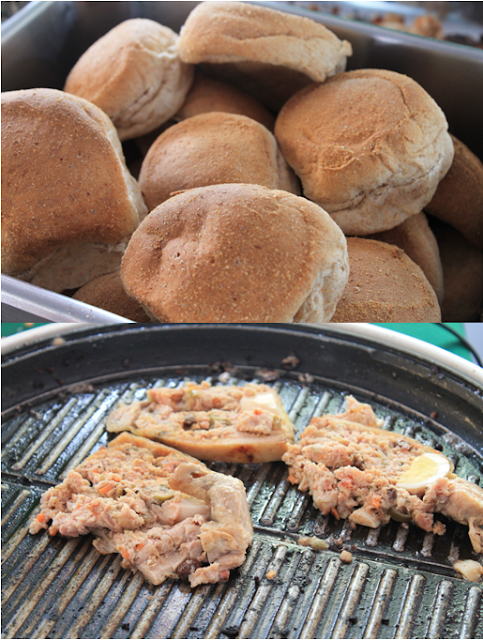 These versatile dishes are not only great with rice, like what Bistro Better did , they had it as a stuffing ("palaman") for "pugon" pandesal (local Filipino bread cooked in limekiln). After Christmas feasting, left-over Morcon, Stuffed Turkey and Embutido are always saved in the fridge for pasta toppings. These are made in advance in bulk and kept in the freezer in time for Noche Buena and when guests arrived during Christmas. Oh, now I'm thinking about Christmas. 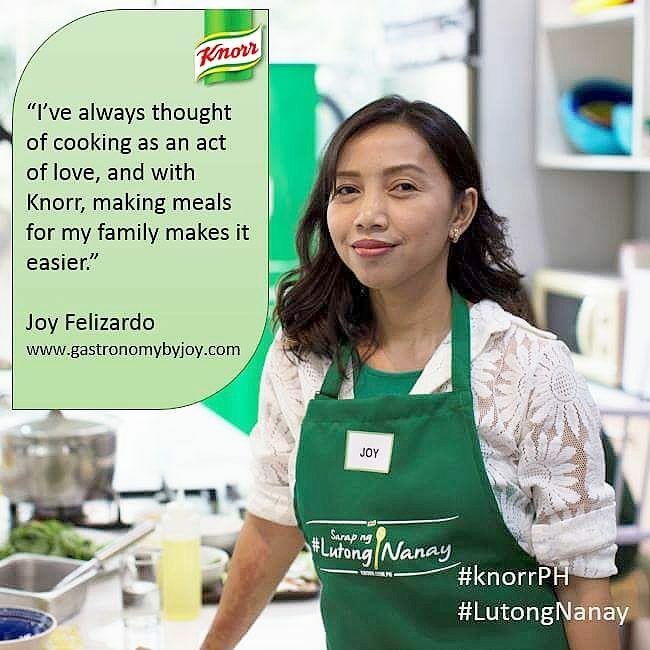 What good thoughts indeed, now I know where to buy those sensational Chicken Galantina and Beef Morcon, I could forever live with these, not a care if I learned or not, how to make them, for I know someone who does it best with all her heart put into it, Mrs. Carmencita Abadicio. And heck, I don't need to wait for Christmas to indulge with these. I only need to go to Mercato Centrale every Friday and Saturday night at 10 pm to 2 am, Saturday and Sunday at 7 am to 2 pm. See, you have ample choices, whether to have fish, beef, pork and of course chicken. Those are some of the reasons why I love Bistro Better, they don't only carry all my favorite dish, those that I don't cook, they are also very innovative when comes to dining and enjoying exquisite comfort foods. Let me ask this question again, who doesn't eat fried chicken? A certain vegetarian would be so proud to raise a hand, or both hands even, and would say pity little feathery pet...A health fanatic would ramble about it being too fatty and cholesterol-rich and most grandmas would always say broccoli is better, hmm, how come vegetables are always better to eat, though less tasty as the meats? Bet vegetarians wouldn't know the answers. Anyways, I don't mean to be against any "food-ology" or principles on eating habits, I just would want to put a stress on how eating a lovely fried chicken could ease your cares away (specially if one is too hungry), and what could a double fried chicken might do even better. Finally, I was able to drag myself into the enjoyment of knowing things behind every foodies thought, and in this case knowing more on the much blogged and talked about chicken diner, Bon Chon chicken. I was planning for the longest time of visiting one Bon Chon restaurant after hearing from a fellow blogger how their fried chicken tastes better than commercialized fast-foods. Also, hearing that "it is the best chicken in America," I did promise myself to have a try on this. Then finally, thanks to one heck of a famous blogger, I was able to check it out at the Ayala Triangle. Alright, I'll be letting you in on a secret. You see, Bon Chon has a unique way of cooking their fried chicken, it's double fried. First, they deep fry a good batch at a controlled heat to evenly cook, till it reaches the meat inside, in this way also, it renders the fat from the chicken and leaving just the healthy goodness in it. Once cooked, they cool it for some time and re-fry the batch, this time putting the secret sauce. You will not see a dry, stone-hard, salty or browned chicken on your plate. What you will get out of this process is a crunchy, without oils running down your fingers, glazed outside and savory meat inside. I didn't care having to lick my fingers after having one and another, Soy Garlic chicken wing. They also have it in Spicy flavor, you will know the difference of it from the other when you see chickens with toothpicks, those are the spicy ones. I do like the spicy chicken, the peppery hotness is just fine for my delicate mouth, but if your's are the dragon-types, who likes it to the extreme spice, you can ask them while ordering so they could adjust the spice for you. What's so appealing about their chicken is the semi-caramel sweetness with a bit of a tang of the glaze which clings to the meat, and to the skin of the chicken. I bet my kids would really love these! Now that we know what the secret is (well there is still a secret though, the special sauce used in the chicken to achieve the true Bon Chon taste) , there is more that you can find either to go with those amazing chicken or enjoy other Korean dishes. Oh yes, Bon Chon is a Korean ideal, the sauces are concocted at Korea and brought all over the world, where there is Bon Chon, like in the US where it became a hit. The Ginger Tofu Salad. Being one of the most-ordered in the salad category, I say why not. I didn't know that finely minced ginger can be a fine ingredient on a salad, sure I had a few asian-inspired salad but as good as this, very light on the tummy, as what a starter dish ought to be, however if you're too health conscious this might be the best lunch or dinner. The Calamari. Bite-sized squid rings that's chewy but not hard to swallow. This has always an issue with several Calamare I had. But Bon Chon's has the ones that is just right to the taste, not salty or too spicy and has the mayo dip that's a perfect match. However, if you've inspected, they don't have a dessert yet, but are now thinking of adding some on their menu. From what I've heard, they had experimented on putting a yogurt station on one of their branches. And are still on the process of incorporating it to the whole Bon Chon ideal. The Fish Taco. Cream Dory cutlets are used to entice any diner who's accustomed to Mexican or Mediterranean dishes. Though it may look Mediterranean, it sure is Korean. Kimchi, a staple of Korean cuisine was added to enhance the sauce mixed in with the coleslaw and cream dory fillets. The hint of kimchi blended in so well with the typical coleslaw had given me a whole new cuisine to get wind on. Then there's Bulgogi Rice. Let me admit, this is my first take on a Korean restaurant or fast-food for that matter. I knew for a fact that Koreans like it hot, however, this one's a topper. The beef slices a top the steamy rice is marinated so perfectly that it will actually mesmerize you, no wonder this is Korea's national dish, and being grilled made it even more healthier. Frying the chicken in a Bon Chon way may be a bit ridiculous but eating it is definitely addictive, grilling the Korean way is way more palatable. to get updates and see more information about them. Hey, don't forget to like their page!